Also serving communities of Port Hueneme. There are 33 Assisted Living Facilities in the Oxnard area, with 7 in Oxnard and 26 nearby. The average cost of assisted living in Oxnard is $2,995 per month. This is lower than the national median of $3,346. To help you with your search, browse the 133 reviews below for assisted living facilities in Oxnard. On average, consumers rate assisted living in Oxnard 4.9 out of 5 stars. Better rated regions include Carpinteria with an average rating of 5.0 out of 5 stars. Caring.com has helped thousands of families find high-quality senior care. To speak with one of our Family Advisors about assisted living options and costs in Oxnard, call (855) 863-8283. Seniors will have much to enjoy in Oxnard, California, such as the Henry T. Oxnard National Historic District and Heritage Square, which showcase early early-20th century homes. Carnegie Art Museum, beachfront views of the Channel Islands, River Ridge Golf Course, and the Elite Theatre are some other popular attractions. Seniors who desire assisted living in Oxnard can choose from six facilities within Oxnard and 35 in the surrounding area. Assisted living facilities in California are referred to as Residential Care Facilities for the Elderly (RCFEs) and are regulated by The California Department of Social Services, Community Care Licensing Division (CCLD) and the Continuing Care Contracts Branch. While Ventura County receives a Particle Pollution 24-hour score of A from the American Lung Association, their Ozone score is an F. Poor air quality such as this is potentially a concern for seniors with a respiratory illness. Oxnard has an array of community resources for seniors, including the Wilson Senior Center, an organization that offers fun games such as Wii bowling and Zumba, and two more senior centers with full calendars of events. The Oxnard area is home to world-class medical facilities, including St. Johns Regional Medical Center and Community Memorial Hospital, in the event of medical emergencies or illness. While the Oxnard cost of living is 42.1 percent higher than the national average, California seniors may enjoy the fact that it is lower than the rest of the state. Seniors living in Oxnard may appreciate the peace of mind of living in a city with a crime rate that isn't higher than the national average. Violent crime is average at 31 while property crime at 33.3 is five points lower than the U. S. average. The city of Oxnard has a climate that is a bit cooler than areas like Los Angeles. Seniors can take advantage of enjoyable sunny days, average winter temperatures of 47 degrees, and gentle summer temperatures of 71 degrees. Assisted Living costs in Oxnard start around $2,995 per month on average, while the nationwide average cost of assisted living is $4,000 per month, according to the latest figures from Genworth’s Cost of Care Survey. It’s important to note that assisted living rates in Oxnard and the surrounding suburbs can vary widely based on factors such as location, the level of care needed, apartment size and the types of amenities offered at each community. 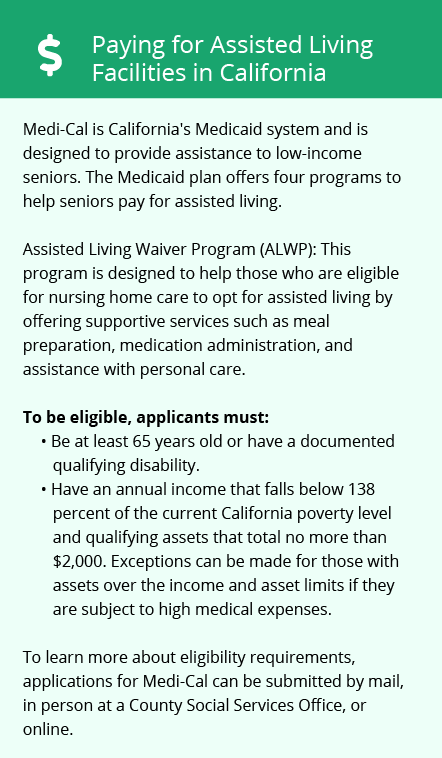 California Medicaid provides financial assistance for qualified seniors through their Medi-Cal plan. 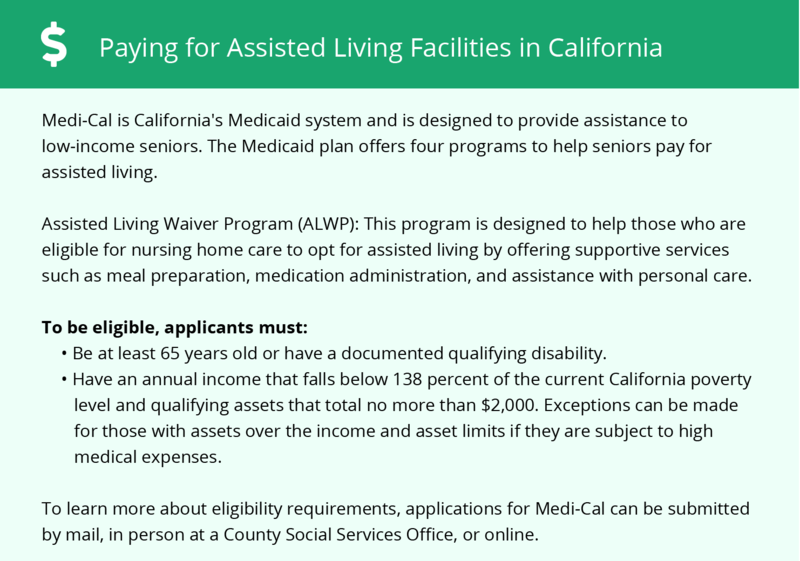 The state also offers four Home and Community-Based Services (HCBS) waivers that eligible residents can apply for if they need additional funding for assisted living costs. To see a list of free assisted living resources in Oxnard, please visit our Assisted Living in California page. Oxnard-area assisted living communities must adhere to the comprehensive set of state laws and regulations that all assisted living communities in California are required to follow. Visit our Assisted Living in California page for more information about these laws.